ROLU’s residency officially began today in Open Field and we have some great photos to whet your appetite for what’s ahead the next 11 days. 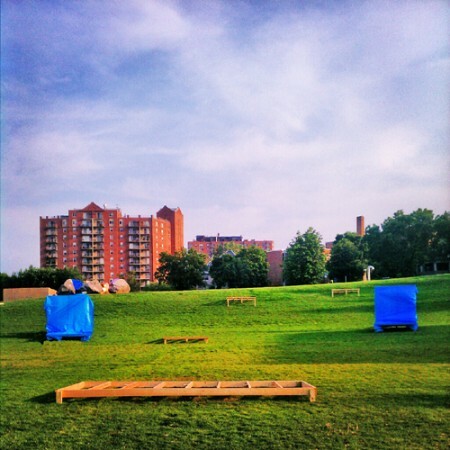 Over the week-end the crew was hard at work building outdoor galleries. 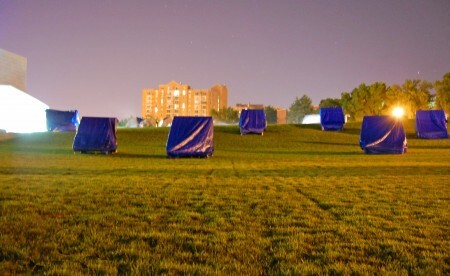 Blue tarps kept the melamine surfaces dry. 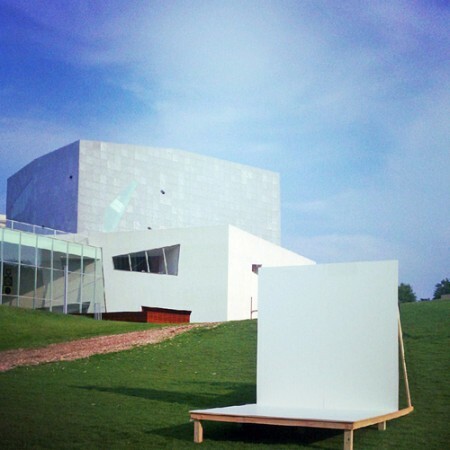 The 11 galleries will stage the Field Collection, a series of lawn-friendly versions of works from the Walker’s collection. Each day, the public is invited to work alongside ROLU to help make the sculptures. Despite the tropical heat, ROLU’s Sammie Warren and Mike Brady continued to be their usual amiable selves. 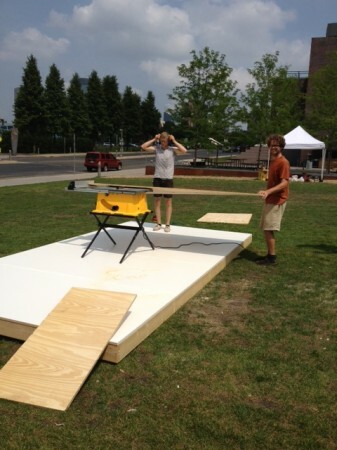 Here they are working on Ellsworth Kelly’s Gate. 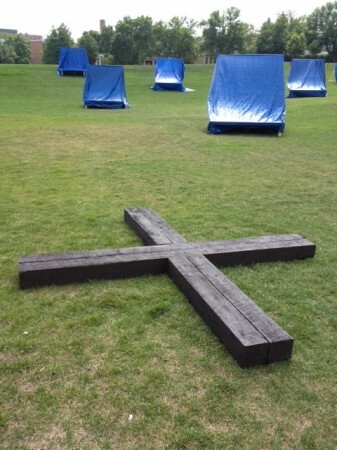 The first artwork to be completed was Richard Nonas’ Razor-Blade, which will remain on the grass. 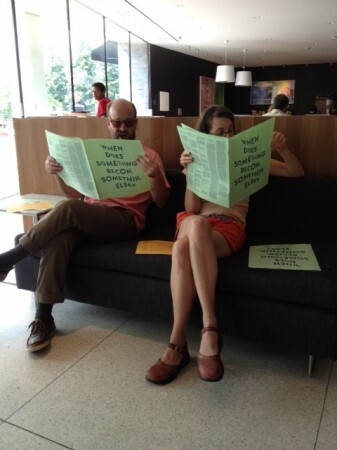 Indoors in the air-conditioning, you could read writings by ROLU’s favorite makers & thinkers, including Sam Gould of Red76 (2010 Open Field artists-in-residence and seated on the left), Uta Barth, David Hamlow, David Horvitz, and Greg Allen. Others, who were feeling a bit more playful, gracefully donned garments made for ROLU by Various Projects, a NY-based fashion design duo comprised of Elizabeth Beers and Brian Janusiak. Inspired by Hélio Oiticica‘s work, as well as ROLU’s practice, Various Projects’ collection of wearable sculptures is an invitation to visitors to experience what it feels like to be seen as a work of art. 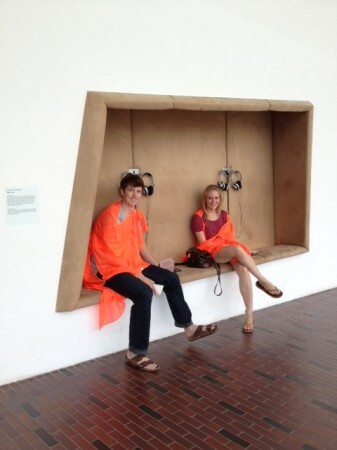 Anyone can participate in this act of performance, and in return you get free gallery admission! Tomorrow brings more making as thinking and participation as performance. Here‘s an overview of artworks they’ll be building until the end of July, we’ll keep the daily log of images coming.